One of Walt’s many keys to success was always hiring the best talent for his company, and that certainly was true when he acquired the services of the Sherman Brothers. 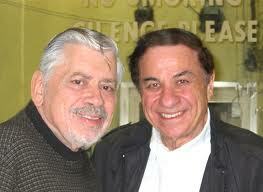 This team of Robert and Richard Sherman wrote more musical song scores for motion pictures than anyone else in history. Their story is magic in itself. They were sons of Russian-Jewish immigrants; their father Al Sherman was an established “Tin Pan Alley” songwriter during the 20s, 30s and 40s. In fact, he wrote the famous song “You got to be a Football Hero.” Richard Sherman stated that he “Got the bug to be a songwriter in College,” and wrote for many college shows. His brother Robert wanted to be a writer. Richard said that it all started after college. Both brothers lived in a small apartment where brother Bob was writing a novel and Richard was writing the “Great American Musical” when a challenge from their father got them started as a team. He bet them “they couldn’t write a popular song a kid would give up his lunch money for.” This challenged them to work as a team and pool their knowledge. He continues, “A good song has a story, a hook. That is what attracted Walt Disney to us.” Walt Disney was perhaps the greatest storyteller of all time. Their relationship with Walt began in 1958 when teenager Annette Funicello sang a song written by the boys called “Tall Paul.” It became a hit tune in 1959, and the publishers at the Disney Company asked if they could write more songs for her which they did. Walt wanted to put Annette in a movie, and he wanted to meet the team that was writing all those songs for her. “That’s how we first met Walt Disney” Richard said. 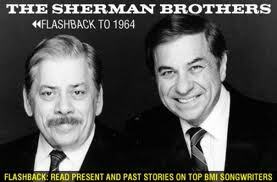 The Sherman brothers began working at the Disney Studios in May of 1960. They wrote for Walt during the last six years of his life, and in that time some of their most memorable pieces were written. Their first major picture for Walt was 1961’s The Parent Trap starring Haley Mills. They wrote the musical numbers “Let’s Get Together” and “For Now, For Always” in addition to the title song “The Parent Trap.” This was the start of their remarkable and productive career with the Disney company where they wrote not only memorable scores for motion pictures but also pieces for stage musicals and, of course, those theme parks songs we all know by heart. Their first Theme Park song was for the Enchanted Tiki Room. The story goes like this…Walt had invited the brothers along with five other people to a sound stage. They all sat down in a darkened room. When Walt turned on the lights, they were in a tropical room surrounded by flowers that started to sing songs and by birds that came down from the ceiling and started singing. This was the yet-unknown Enchanted Tiki Room, the first audioanimatronic show. One of the men asked, “What the devil is this, Walt? ” and Walt said to the brothers, “You guys are going to write a song to explain what this is all about.” Brother Bob suggested that they include a parrot for lyrics, and Walt came up with the idea to use four parrots, plussing the idea further. It was then the brothers suggested a tropical rhythm, like a Calypso beat. The Sherman’s came up with the word “Tiki” and that’s how the attraction and song got its name. Perhaps their best known and most loved song is “It’s a Small World After All,” which was written for Disney’s 1964-65 World’s Fair attraction, It’s a Small World. The Attraction was originally called “Children of the World” and the original idea was that each country’s children would sing their national anthem. The outcome was disastrous, so Walt decided that he needed one simple song that could be translated easily into many languages, and the rest is history. It is claimed that “It’s a Small World After All” is the most played song on earth. And we cannot forget all the theme park Songs. Like all of the Brothers music, songs for the theme parks told a story, setting the mood and involving the guests almost interactively with the attraction. Guest favorites from Winnie the Pooh include “Winnie the Pooh” and “The Wonderful thing about Tiggers” as well as “One Little Spark” from EPCOT’S Journey into the Imagination and a personal favorite of mine, “It’s a Great big Beautiful Tomorrow” from Walt Disney’s Carousel of Progress, also from the 64-65 World’s Fair. That attraction actually had two songs, both by the Sherman Brothers. After the attraction moved from Disneyland to Walt Disney World in 1974, its sponsor General Electric wanted an updated tune for the move and “The Best Time of Your Life” sung by Andrew Duggan was used. In 1994 during Tomorrowland’s refurbishment, the original “It’s a Great Big Beautiful Tomorrow” was reinstated. Some of the brother’s best memories of Walt Disney were his kindness and his insistence on the best quality of the product. He was also very generous. When Albert R. Broccoli (Of James Bond Fame) wanted to co-produce a movie with Walt Disney and have the Sherman’s write for the movie (Chitty Chitty Bang Bang in 1968), Walt was too busy at the time He did, however, give the brothers a leave from their Disney contract to do the film. This kindness led to their third Academy Award nomination. The awards that this prolific team has won are nothing short of magic. They have been nominated for seven Academy awards and won two. They have two Grammy nominations and were awarded one for Mary Poppins. In 1976 they got a Star on the Hollywood Walk of Fame. In 2003 they won Best Musical for an adaptation ofChitty Chitty Bang Bang. They were also nominated for five Golden Globe awards. They were named “Disney Legends” in 1990 and received perhaps one of Disney’s most coveted honors, a window on Main St. USA in Disneyland honoring the Brothers contributions to the theme parks. They have won or been nominated for awards from Laurel, the Songwriters Hall of Fame, the Moscow Film Festival, Annie Awards, the Christopher Award, BAFTA Awards, and, in 2008, President George W. Bush awarded them the National Medal of Arts, the highest honor the US government can give an artist. 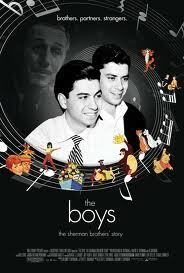 The lists go on, but think of just how different the songs of Disney would be if not for the genius and dedication of the Sherman Brothers, Disney’s Music Makers. Contributed by: Bill Iadonisi (NDH#35) Bill is the DDL History Blogger.